DETROIT, Mich.-The momentum is beginning to build for women’s track & field at Detroit’s Marygrove College. The young program signed their third student-athlete in two weeks when Kylia Johnson inked a 2010-11 Letter of Intent. 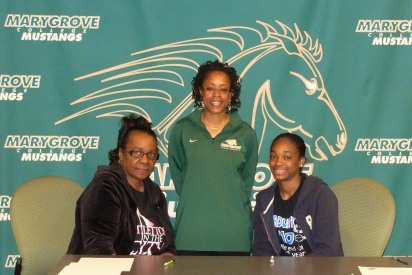 Johnson, a 5’2″ sprinter, commits to the Mustangs after a highly respected career at Southfield High School. The fierce competitor lined up against the opposition in the 100m, 200m, 4×100 meter relay and 4×200 meter relay. The first three years of her career all ended with high honors as Johnson was named to the All-State Team from 2007-2009. With one season to go, Johnson is sure to be a favorite to land on the All-State Team once again in 2010. Coach Womack on Johnson: Kylia is a great runner with a positive attitude. That combination will give her a great opportunity to excel at the next level. I have no doubts Kylia will be a tremendous asset to our new program next season.